FSLogix is a next-gen app-provisioning platform that optimizes the ingredients — hardware resources, time, and human resources — needed to offer virtualization support when deploying and scaling Windows and Office on Azure. As usual, the financial details have been left out of the spotlight. Back in September 2018, Microsoft announced the Windows Virtual Desktop service, which allows its users to run a modern desktop experience on Azure. Right now, Windows Virtual Desktop is the only cloud-based solution capable of providing a multi-user Windows 10 experience optimized for Office 365 ProPlus. Thanks to Microsoft's latest corporate acquisition, the Office 365 virtualization experience promises to become even better. FSLogix is a modern app-provisioning platform that is now a part of Microsoft. 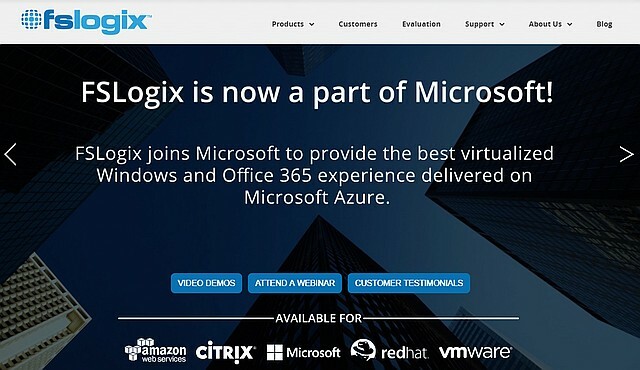 According to the message recently posted on the homepage of its website, FSLogix is joining the Redmond-based giant "to provide the best virtualized Windows and Office 365 experience delivered on Microsoft Azure." Microsoft's angle is about the same, and it only sounds a bit different, since the blog post about the acquisition claims that the target of this move is to "help extend our virtualization capabilities and provide an even richer experience for Microsoft 365 customers." Most home users do not need the benefits of a virtualized environment, but Microsoft's improvements for its business customers — at least some of them — end up enhancing the experience of many home users — sooner or later — as well. The financial terms of the deal have not been disclosed.